Is It Good? Juice Squeezers #4 Review – AiPT! 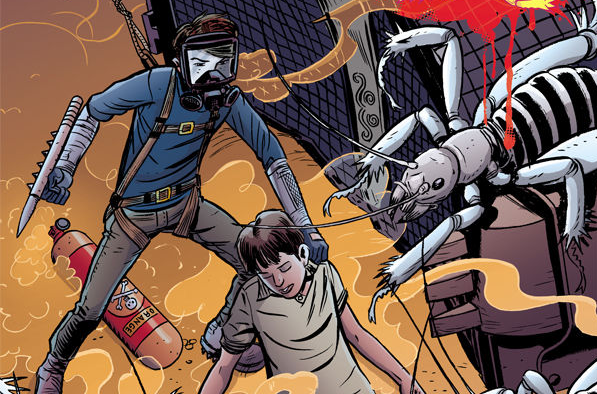 With Juice Squeezers #4, David Lapham’s all-ages miniseries about a team of middle schoolers that battle creepy-crawlies underground comes to an end. Or does it? It’s pretty good. Or is it? I would have loved Juice Squeezers when I was eight or nine years old. Thanks to media like Harry Potter, Power Rangers, and even Hey Arnold, I used to fantasize about going off on perilous adventures with my friends—free of adult supervision, of course. This was a time when mysteries and villainy were abound in my own school and backyard; neighbors that were a bit too quiet were secretly mad scientists performing hideous experiments in their basements, and every cackling bully might as well have been The Joker. (Un)Fortunately, the truth was that my neighbors simply liked to keep to themselves, and I was usually too timid to deal with my bullies in a manner befitting the supervillains that they were. So, like so many other troubled children, I took my frustration out on bugs. For a short period of my life, every ant, spider, and fly was a monstrous intruder trying to attack my family, and it was up to me, strong, valiant son that I was, to protect my home by attacking the invaders as violently as possible. I know that I wasn’t the only child to entertain such fantasies, so it’s likely that Juice Squeezers. is writer/artist David Lapham’s attempt to literalize such childish behavior, albeit with a cast of characters that’s a little bit older than I was when I would have wanted to join the Squeezers. Posing as an after-school “basket weaving” club—an attempt to appear so boring that nobody would bother raising an eyebrow—the Juice Squeezers dig into the tunnels of their desert town and fight off the giant bugs threatening to destroy crops. We’re told that these bugs can also be deadly, but throughout the series we haven’t seen much proof of this. Up until this final issue, the biggest problem with Juice Squeezers was that there wasn’t much sense of danger. The Squeezers aren’t scared of them, so most readers will likely react the same way unless they have some sort of phobia. These kids are so adept at killing the things that there isn’t much reason to be concerned for their fates. The fourth issue finally achieves a sense of high-stakes danger, but it feels like too little, too late. Luckily, Juice Squeezers is not without its saving graces. The dialogue is solid, and while it’s a bit too exaggerated to say that Lapham nails the voices, it still maintains a suitable amount of believability. Perhaps more importantly, though, the art is fantastic, with a lively yet nuanced color palette by Lee Loughridge. It’s a bit strange seeing Lapham’s art style on an all-ages book hot off of the heals of the return of Stray Bullets, but it works. The bug-squishing antics of Juice Squeezers should entertain younger audiences, but the dose of adrenaline that the series finally receives in its last issue isn’t enough to save the series.